NASA Probe Lands Safely On Martian Surface There's a new probe on Mars. After Monday's tricky landing, NASA's InSight spacecraft is to deploy a sensitive seismometer and temperature probe to let scientists explore the planet's interior. 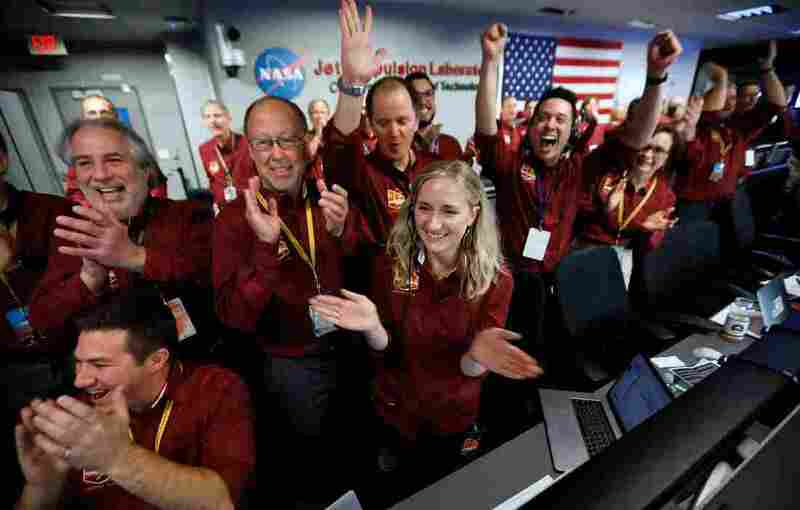 NASA engineers on the flight team celebrate the InSight spacecraft's successful landing on Mars at the NASA Jet Propulsion Laboratory in Pasadena, Calif., on Monday. NASA's InSight probe landed successfully on Mars Monday shortly before 3 p.m. ET. Two tiny spacecraft that flew with the lander to Mars were able to relay telemetry from the probe as it descended to the surface. As a result, mission managers knew immediately that the landing had worked. Unsurprisingly, the control room at the Jet Propulsion Laboratory in Pasadena, Calif., erupted in cheers. In the coming days, mission managers will be assessing the health of the probe after its 300 million-mile trip. 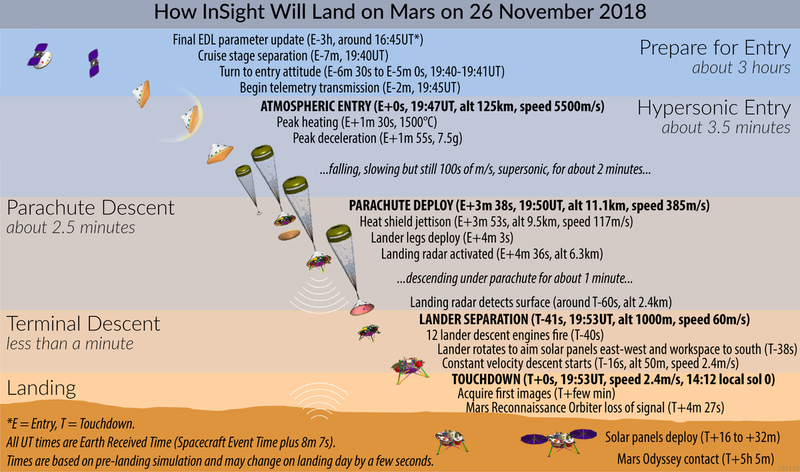 It will be some weeks before all of InSight's scientific instruments are deployed, and six months or more before the first scientific results are in. Landing on Mars is no simple task. InSight had to slow down from 12,300 mph as it entered the top of the Martian atmosphere. It reached a complete stop on the ground 6 1/2 minutes later. "The landing is all completely automatic and autonomous," says Rob Grover, leader of the Entry, Descent and Landing team at JPL. "We have no ability to actually, kind of, fly the lander to the surface." 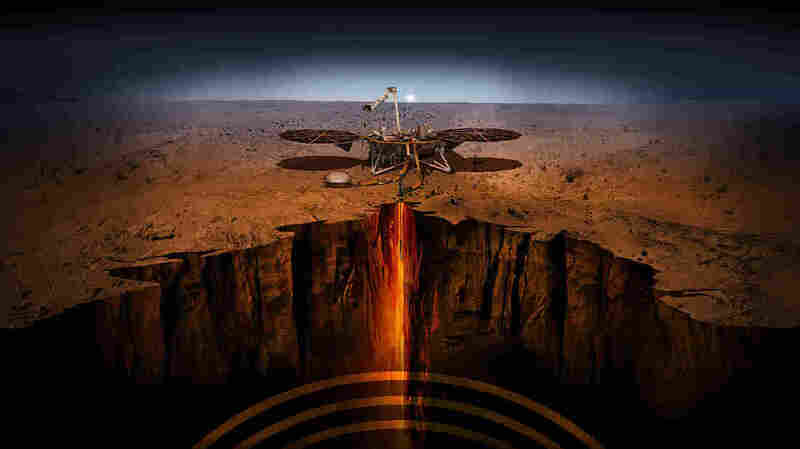 An artist's depiction of InSight — short for Interior Exploration using Seismic Investigations, Geodesy and Heat Transport. The spacecraft has been designed to give Mars its first thorough checkup since the Red Planet formed about 4.5 billion years ago. The reason real-time control isn't possible is that it takes a radio signal approximately eight minutes to travel from Earth to Mars. Because the entire landing sequence takes only 6 1/2 minutes, the lander would already be on the ground by the time a signal from Earth arrived. Here's how it happened: About 90 minutes before atmosphere entry, mission managers sent the latest tracking information to the probe, so it knew where it was and how fast it was traveling. Then, the probe got rid of what's called the cruise stage. That's a part of the spacecraft needed only while InSight is traveling from Earth to Mars. "We eject that from the vehicle seven minutes before we're going to hit the top of the atmosphere," Grover says. After that, the spacecraft turned, so its heat shield was pointing in the right direction. As the probe descended, the air molecules that make up the Martian atmosphere struck the heat shield, causing the shield to heat up and the craft to slow down. "Believe it or not, 99 percent of the energy that we have coming in from space is actually bled off by the atmosphere," Grover says. InSight's landing was carefully choreographed. The heat shield did its thing for about 3 1/2 minutes, then the parachute deployed. At that point, the probe was still traveling faster than the speed of sound, so InSight had a special parachute designed for supersonic speeds. Finally, the probe cut loose the parachute and landed using rockets. "The whole descent under rocket power takes about 40 seconds or so," Grover says. "We have 12 small descent engines grouped around the bottom of the lander that are providing the thrust to slow us down the final kilometer." Even though they couldn't do anything to help InSight as it descended, mission managers were able to watch it land, thanks to a pair of small spacecraft known as MarCO. The MarCO spacecraft hitched a ride with InSight. "It's about the size of a cereal box," says Anne Marinan, a systems engineer on the team that's in charge of MarCO. It is one of a new generation of really small satellites called cubesats. "Cubesats were originally developed as a way to easily give students, essentially, access to space," Marinan says. Cubesats are now being used at NASA to test new technologies. In MarCO's case, the new technology is communications equipment that will relay telemetry data from InSight to Earth. InSight landed on what seems to be a very boring part of Mars, known as Elysium Planitia. Mission managers wanted a boring spot — they want the probe to sit quietly. Its two primary instruments, a sensitive seismometer and an underground temperature probe, will be measuring tiny fluctuations in the planet's interior. To make accurate measurements, those instruments shouldn't be disturbed. If they work properly, scientists should get a better sense of the interior structure of the Red Planet. The mission is expected to last about two Earth years.